On the days when I want to feel all smug and virtuous, I like to have granola for breakfast. It’s usually downhill after that! No seriously, it’s a great breakfast; so quick, filling and relatively guilt free. The problem I have is getting a granola with no dried fruit in it. I generally really don’t like raisins, sultanas etc. The only one I found is quite expensive and as I am the only one eating it, it goes off before I’m even half way through it. So, when I saw the recipe in Gizzi Erskine’s Skinny Weeks & Weekend Feasts I knew I had to give it a try. The only fruit mentioned is dried apples and I thought, I can go with that. Nope, turns out I don’t like dried apples either! So I took them out and I think it is perfect. I will include them in the recipe but I personally don’t use them. The recipe is adapted slightly. I like to have fresh fruit such as strawberries, topped with low fat natural yoghurt and granola. Or if I have less time I mix the yoghurt with a bit of runny honey instead. 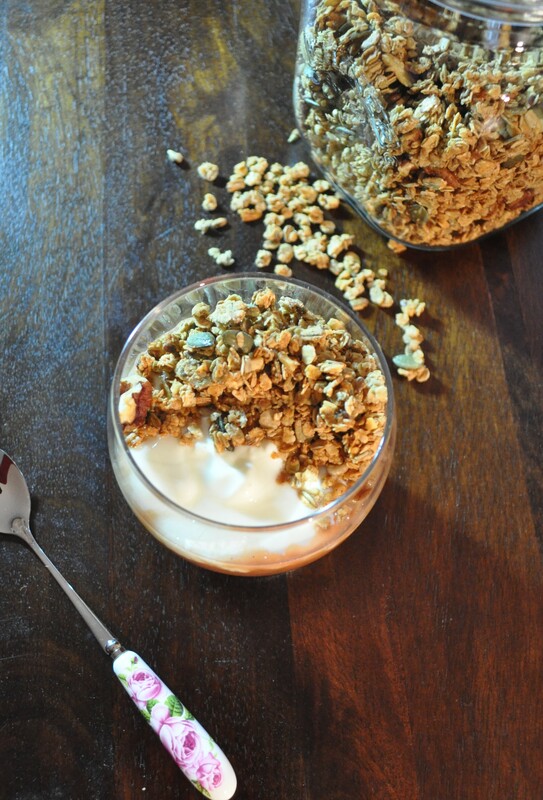 You can also eat the granola plain with milk, like any breakfast cereal. Here I made the accompanying rhubarb compote from Gizzi’s book. I wasn’t sure if I’d like it but it is really good. I halved the recipe for the compote as it makes quite a lot. To quote the book, “Making your own granola may seem like a pointless faff”. Trust me, it isn’t. It is delicious and you can control exactly what goes into it. A lot of the shop bought ones have a frightening amount of sugar. You should be able to get all of the ingredients in a health shop if they are not in your supermarket. Feel free to play around with the ingredients too. Preheat your oven to 150c/130c fan/gas mark 2. Mix the oil, agave nectar, honey, cinnamon, vanilla together in a large bowl. Add in all of the remaining ingredients except the apples if you are using them. Mix everything really well together and then spread the mixture thinly and evenly on to two baking sheets. Bake for 20 minutes. Then break up the mixture and stir it around and bake for a further 10 minutes. If you are adding the apples do it after the 20 minutes. Remove the baking trays and spread it evenly onto a flat dish to cool. It will crisp up as it cools. After it has cooled, pour it into an airtight container and store in a cool dark place. It will keep for up to a month. Place a pan over a low heat and add the juice, agave nectar and vanilla. Stir until the agave nectar dissolves. Add the rhubarb. Bring it to a simmer and then remove from the heat. Cover the pan leave it for 10 minutes. The rhubard should break down into the compote. Give it more time if needed. Remove the vanilla pod if you used one. When cool store it in an airtight container in the fridge. It will keep for about 4 days. Spoon 3 tbsp. of the rhubard compote into a glass or bowl. 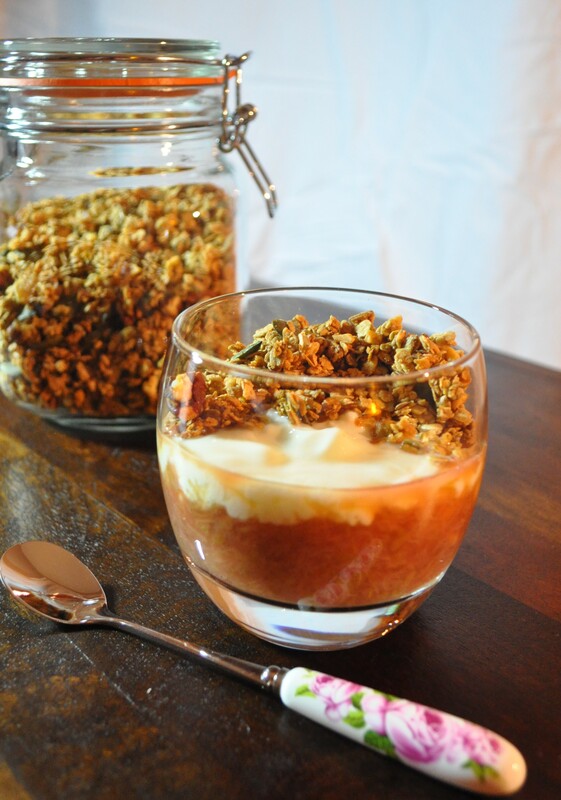 Top with 125g pot of natural yoghurt, I use Glenisk Low Fat Natural Yoghurt, and about 40g of the granola. Enjoy! If my husband saw this he would leave me! I agree with you, it’s best that you can control the contents! Yours looks so good!